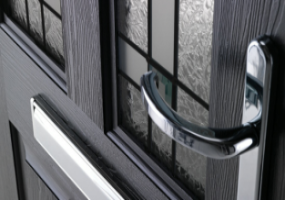 ” Installing modern UPVC or Composite Doors will improve the look of your home, make it more secure and desirable. Compare 3 quotes from trusted UK installers & save money on your home improvements. Functional and great looking, replacement residential entrance doors are available in a multitude of designs and colours; choose side panels, top panels, double or even triple glazed units. 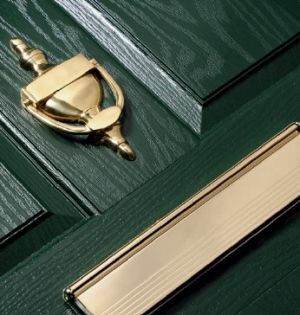 Most people would accept that a good quality front door is always going to give others their first impression of the property & its occupants, but it’s also one of the first places unwanted guests will investigate – it’s not only friends who come in through them, statistics in the UK point to around 70% of all burglars enter via a door. Modern Exterior units are fitted with high security locks, and both uPVC and composite doors are extremely resistant to forced entry. The tight fit of the door to the frames also reduces noise, improves weather resistance and virtually eliminates unwanted air draughts and so helps to keep more heat in the home. A modern elegant entrance sets the tone for the whole house, attractive and secure, Composite or PVCu designs make all the difference. Installing energy-efficient doors will also reduce your energy bills, keeping your home warmer and quieter. Ever since early 2002, replacement windows & doors will need to be certified “compliant “for Building Regulations part of which covers the requirements to meet minimum standards for things such as energy efficiency, means of escape, fire resistance & ventilation. So, should you inadvertently end up using an installer who is not a registered member of one of the UK trade bodies, it could cause you more work to get the local authority to certify them for you, plus the extra time & expense of arranging your own assessment by Building Control – It’s easier and less stressful to let us bring the best companies direct to you. Ensure your quotes are from CERTASS / FENSA / GGF or DGCOS members.